But it turns out, Jack and a band of television producers can't stop them. 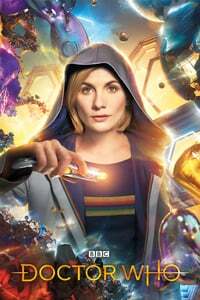 The Doctor tricks Rose into returning home and then works on a Delta Wave emitter which will wipe out the Dalek fleet, but will also destroy Earth. Rose, inspired by seeing "Bad Wolf" chalked on a street, breaks into the heart of the TARDIS and absorbs the time vortex, giving her ultimate power over space and time. She dissolves the Dalek army into molecules and resurrects the dead. The Doctor absorbs the time energy, saving Rose but killing him in the process. At the time of broadcast, it was the most expansive view of a Dalek army that had yet been portrayed on screen, taking the record from Planet of the Daleks. Although he is soon brought back to life, Jack's death in this episode makes him the first companion to die since Kamelion in Planet of Fire. Back in 1993, the BBC produced a documentary entitled Thirty Years in the TARDIS, which ended with several scenes showing how modern-day special effects could be applied to "new" Doctor Who production. One of these scenes shows many Daleks hovering together. Whether by accident or intent, this episode includes several scenes that strongly resemble this "what if" scenario. The scene in the restaurant after the Doctor has sent Rose back to Earth and she tells her mom and Mickey that the Doctor hasn't made her "better than them" but he did show her a better way of living your life gets me every time. It's a real shame Eccleston didn't get another season. He really came into his own over the last few of his run. My favorite scene is when Jackie turns up in the tow truck, saying somebody owed her a favor and never mind why. And Jack becomes a Special Boy. Eccleston is, and always will be, one of my favorite Doctors. "My favorite scene is when Jackie turns up in the tow truck, saying somebody owed her a favor and never mind why." I love all the hints we get about Jackie's life between visits from Rose. It's no life between the stars, but clearly she has a lot more going on than Rose gives her credit for. Required viewing after this: Doctor Who's 2005 Children in Need special. It's essentially a much longer version of Rose and the Doctor's reactions to each other after the regeneration. I had planned to start off next Wednesday's Christmas Invasion with that very link.